I recently discussed the faithful and visually opulent 1956 film version of The King and I, with it’s unforgettable (and Oscar-winning) performance from Yul Brynner and equally memorable (and similarly Academy Award-winning) sets and costumes. But the film boasted two other equally lauded and awarded assets:Carlton W. Faulkner’s sound recording and Alfred Newman’s adaptation of the score. With it’s lush cinematic orchestrations, more assessable (i.e. lower) keys and smooth vocals (most of which were dubbed), the original motion picture soundtrack was always a worthy (if incomplete) alternative to those who found Gertrude Lawrence’s vocals on the OBCR an acquired taste. Though the movie cut “My Lord and Master”, “Shall I Tell You What I Think of You”, “I Have Dreamed” and “Western People Funny”, the first three have always been featured on the soundtrack (though “I Have Dreamed” appears as a joint track with “We Kiss in a Shadow”). The film also features a new musical finale, with an offscreen chorus singing a heavenly reprise of “Something Wonderful”. Miss from the soundtrack is assorted underscoring and “The Small House of Uncle Thomas”. A lavish 2001 re-issue offers crips remastering of everything heard in the movie. A detailed booklet describes the state-of-the-art, six-channel recording techniques used, and the elaborate set-ups required to isolate each recorded element, allowing for maximum control in the final mix. “The Small House of Uncle Thomas”, for example, required three separate rooms in two buildings–connected to each other via closed circuit television–for, respectively, the musicians, the vocalists, and the dancers (to whom everything was timed). The inclusion of “…Uncle Thomas” also means that Rita Moreno, whose “We Kiss in a Shadow” is dubbed, finally has a presence on the soundtrack that reflects her performance onscreen. (Her own vocals on “My Lord and Master” have appeared on all versions of the soundtrack–though the song does not appear in the film–and calls into question the necessity of replacing her vocals at all). 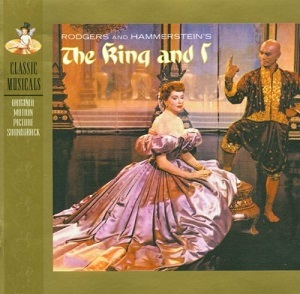 Instrumental highlights new to this reissue include: the original title sequence (previous editions of the soundtrack included an overture not used in the final cut of the film), “Anna and the Royal Wives” (underscoring the incorporates the melody from the cut “Western People Funny”), and Alfed Newman’s adaptations of underscoring from the stage show (“Waltz of Anna and Sir Edward”, “The Letter”). In its present form, the soundtrack offers an account of the score that is among the more complete renditions, in addition to being particularly lush and rewarding. 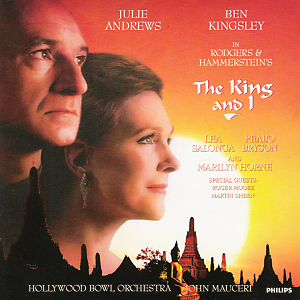 In 1992 John Mauceri conducted a studio recording of The King and I featuring the notable Anna/King pairing of Julie Andrews and Ben Kingsley backed by the Hollywood Bowl orchestra. This recording is perhaps singular of all studio recordings of musicals in that it boasts a scrupulous recreation of Alfred Newman’s adaptation of the score, rather than the original Broadway version. Though Andrews and Kingsley are inspired choices, the results aren’t particularly thrilling. Kingsley has a lot of fun what he has of role, but the bulk of The King’s material isn’t musical, so the best he can do is hint at what he could accomplish if given the chance at a full production. If you are at all familiar with Andrews’ voice and mannerisms you can imagine what she sounds like as Anna, and her performance offers no real surprises. Opera star Marilyn Horne offers a rich, mellow “Something Wonderful” that is just what the title says. The disk’s greatest asset is Lea Salonga’s impassioned, belty, Tuptim. Her “My Lord and Master” is surely the best rendition of the song I will hear as I continue my survey of King and I recordings. If Peabo Bryson is an eyebrow raising choice of Lun Tha, his duets with Salonga work surprisingly well.